It had been 3 years since I’d returned to Kenyon – not enough time for Gambier to lose its familiar comfort and quirkiness, but enough time for me to completely forget about the street that led me up the hill to “downtown.” I pumped up the hill, which I remembered as a formidable end to every ride I took those years ago, but which was oh so much easier than the many rollercoasters of the morning outside Granville. I had contacted a handful of key people at Kenyon before arriving, but things didn’t come together until the last minute. 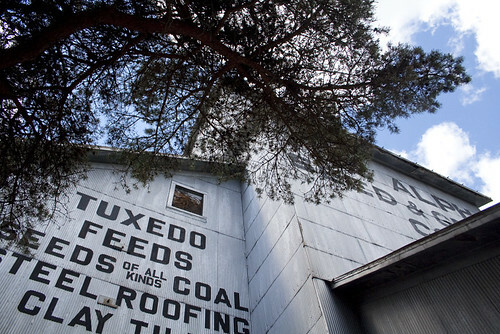 I had planned to visit a few farms near Fredericktown on Friday, but freak winds had blown through on Tuesday evening and left them with lost barns and too much of a mess for visitors. My cold had settled in with full force, though, so I didn’t fight the unexpected rest day. Ruth and I went down to John Marsh’s farm on the edge of Gambier, where Matt Riley gave us a tour. 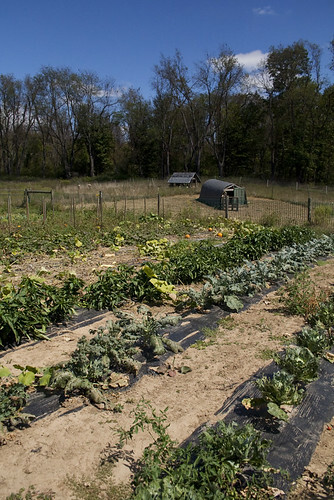 I’d heard of Matt – a friend of Aaron Zaremsky (in Yellow Springs), Matt’s a recent Kenyon grad who’s stayed in Gambier to tend this farm, as well as another he started at Wiggin Street Elementary School. This is the farm’s first year, and it’s mostly experimental. 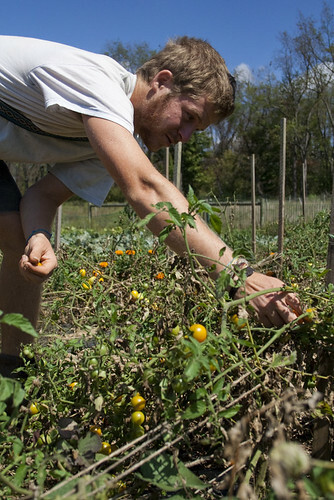 Matt and the others, including John, have a great piece of land, and plenty of hopes for supplying the Kenyon dining hall, co-ops, and local food banks with fresh produce. 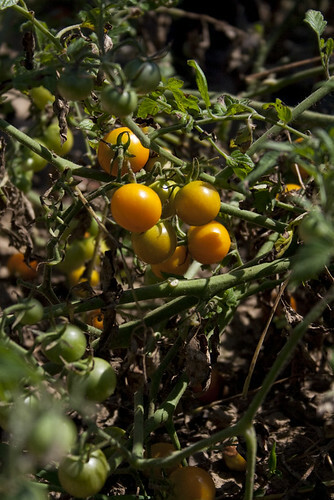 Right now, there’s just not enough man-power to harvest everything, and connections to get the food to people who need it are still not well-established, so lots of Matt’s efforts are focused on saving as much as possible from being tossed in the compost. 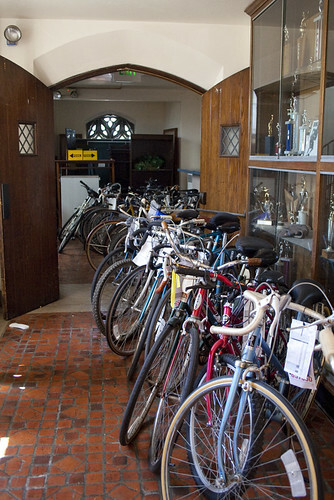 When evening approached, I headed over to the Parish House for a workshop with students from PEAS (People Endorsing Agrarian Sustainability), a student organization led by Sara Berman, my enthusiastic and reliable contact on campus. A great crowd showed up, full of questions and enthusiasm and knowledge, and a couple of hours later I fumbled across the street with more yogurt than I had room to incubate. Disaster was averted, however, thanks to Ruth and Joseph’s fancy dehydrating oven. Saturday morning opened chilly and gorgeous, and I was pretty near ecstatic as I pedaled into Mount Vernon on the Kokosing Gap Trail. Melissa Raines had published a piece about me in the Mt. Vernon News on Friday, so plenty of people came up to me having read that I would be at the market. The crowd was fantastic – all ages, and I nearly ran out of my samples, saving some for afternoon demonstrations back in Gambier. I restocked on yogurt recipe flyers, then set up in front of Farr Hall right in downtown Gambier. I quickly gave away all of my goat milk yogurt, which was absolutely delicious, and met plenty of wary and very excited Kenyon students. 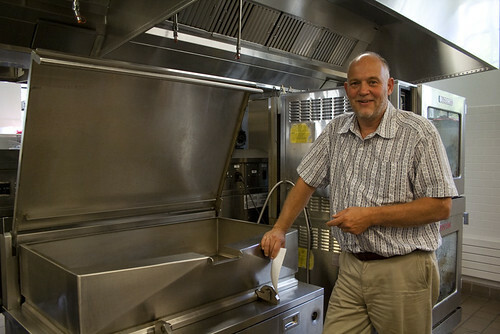 On Sunday I got to see the new Peirce dining hall – backstage! I met John Marsh, who owns the farm I visited Friday and is in charge of getting local food into the dining halls, to talk about the feasibility of making homemade yogurt in the kitchens. I was really looking forward to it – it’s just what I’d been hoping to do on this entire trip: inspire people to make their own yogurt. It’s pretty easy for people to taste the difference in freshly-made yogurt, even if the texture isn’t just what you like every time. And John understands. I’ve long been an avid cook, my love for farms was a major inspiration for this trip, and I’m now very much involved and invested in food distribution at Open Produce, but I’ve never worked in kitchens before, and I loved seeing all of the enormous machines arranged cozily in the surprisingly-small Peirce kitchen. Space is certainly lacking, John concedes, but that didn’t stop us excitedly re-arranging pots and pans to determine possible set-ups for the various stages of yogurt-making. He has two enormous “kettles,” where milk could easily be brought to temperature. Then, eliminating one key observation stage, there is a handy “chiller” that can bring the milk quickly down to a certain temperature and keep it there steadily. After inoculation comes the incubation stage – and this is where things always get complicated. We played around with different ways to immerse yogurt pots in water, rest them on hangers in the heaters, or (if necessary) resort to using the very exposed pilot lights on the many gas burners. I left hopeful, and John was excited about experimenting with the stability of hot water temperatures in the kettles overnight. I can’t wait to hear how they go, and I hope to hear that Kenyon students are eating homemade yogurt before the year is up! 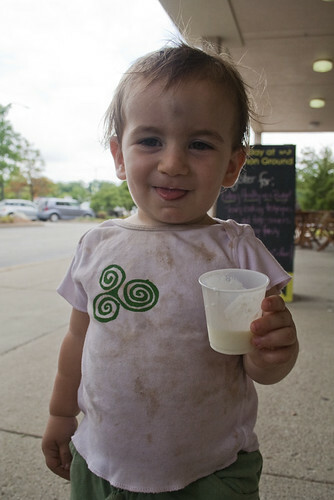 Does anyone have suggestions for yogurt-making on a semi-industrial (10-15 gallons/day) scale? 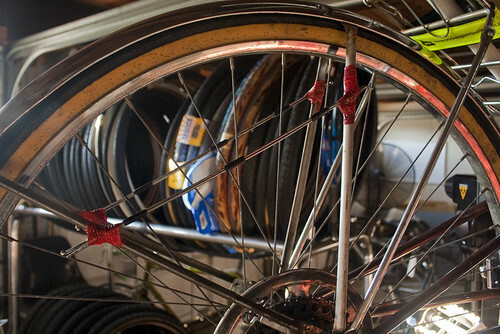 I left Worthington on Tuesday with a hint of a cold, a new spoke in my rear wheel thanks to Baer Wheels – open on Labor Day – and a good night’s sleep with Paul and John in their fine house, which holds the most books I have ever seen in one home. The ride out of Columbus was surprisingly pleasant, and I made it to Alexandria for a “picnic” lunch in front of a storefront I found myself strangely coveting. I arrived in Granville in the mid-afternoon, marveled at the picturesque town center, and drank hot tea until the farmers market started at 4:00. 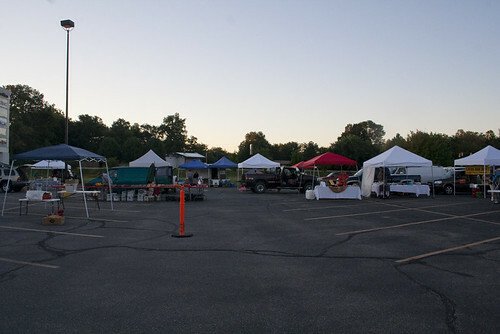 Larry, the market coordinator, kept apologizing for the sparsity of the Tuesday evening market, furthered by its being the end of the season, but I was happy to be there after the size of Dayton’s Saturday market. Gil, who sold produce with his wife June, was my biggest Granville fan – he spent years running a big dairy farm, and he told me some incredible stories about his time in Biarritz and on trains throughout Europe during the war. Storm clouds threatened for the entire time I was there, and the wind picked up as the hours passed. I left a little early, afraid I was going to get caught in early darkness or rain, and pedaled weakly up the hills to Bill and Kathi’s house. I had been warned the driveway was steep and gravel. I had not, however, counted on loose gravel on a curving driveway, and thunder rumbling ever closer. I started pushing my bike up the hill, but my feet just slid down with each step I took. I made it about 30 feet up the hill, gave up, and turned my bike perpendicular to unfasten the cart and do it in two turns. It was hard enough to drag both parts of my rig up the hill, but I made it, and less than two minutes after I had brought all of my gear in the front door, the skies opened up and the rain poured down. Wednesday I woke up in the thick of a cold. Good thing I had planned for a rest day! 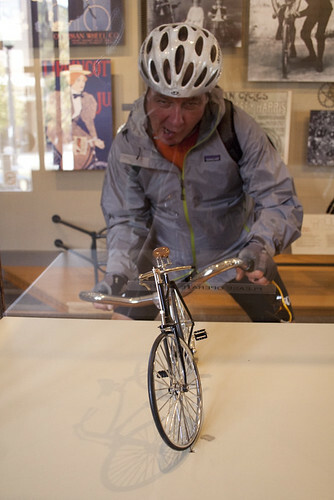 I did emerge for a couple of hours in the afternoon, however, to do some demonstrations on the Denison campus. I had tried to contact their sustainability office, but had no response, so I decided to test my luck like I had at Earlham. I was told, with both sympathy and threats, that security would be forced to ask me to leave campus because I was not sponsored by a campus organization. I had biked all the way up that enormous hill, more ominous than Gambier’s, only to ride down again. I blew my nose a few times and began the descent. 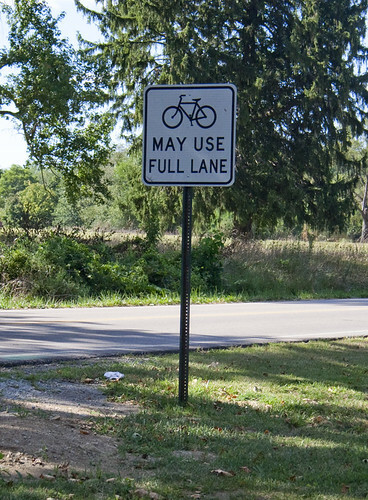 What luxury to ride bikes in Ohio! Dad and I rode almost the entire 32 miles today on nicely paved off-road bike paths, and we couldn’t have asked for better weather. 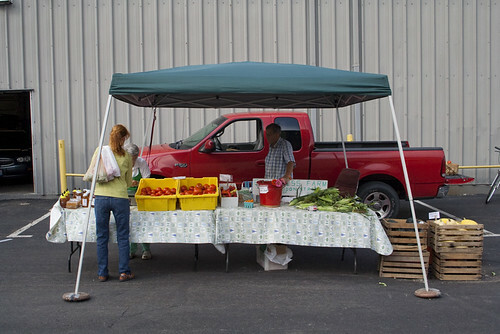 We started the day at the only farmers market I could find in Dayton, the Wright Dunbar Farm Market, which consisted of one truck from Stubbs Family Farm, loaded down with beautiful produce and meat and baked goods from their farm and an Amish friend’s farm in Indiana. Not quite the bustling Urbana market, but I did talk to a few people. 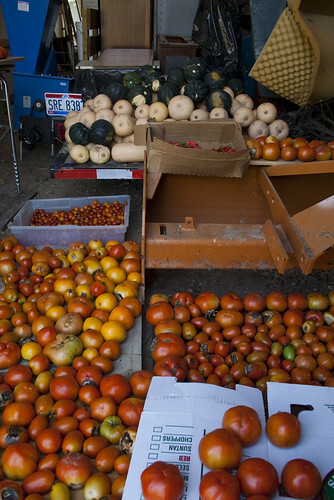 Like the 61st Street Farmers Market in Chicago, the Stubbs take EBT cards, and this farm stand is one of the few sources of fresh food for neighborhood residents. 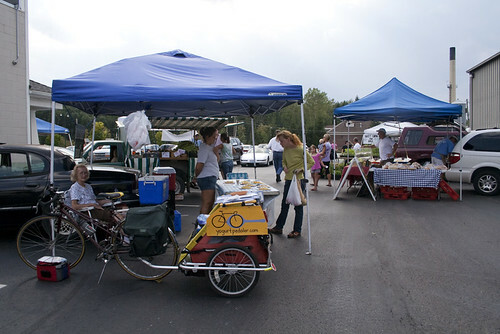 They’re in their first year, and while Dayton is evidently a difficult municipality to convince of the value of markets, hopefully the success and popularity of the Wright Dunbar Farm Market will lead to more much-needed markets throughout the city. 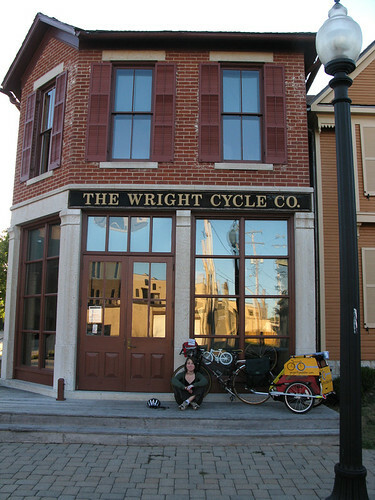 And, it was across the street from the Wright Cycle Co, home of the Wright Brothers’ famous bike shop! And, across from the studio/gallery of Willis “Bing” Davis, an incredible artist, ambassador, and bringer of life and inspiration to Dayton and the Wright Dunbar community. The neighborhood was burned down after Martin Luther King, Jr. was assassinated, and left to rot until Bing Davis took initiative a few years ago, got some local resident contractors and construction workers to team up with students at the nearby vocational school, and reconstructed the building that now houses the Ebonnia Gallery. It’s no ordinary gallery, though – it’s a school, a youth center, and the heart of many initiatives run by Bing and his wife to promote the arts, culture, and history of Dayton. He has truly transformed the Wright Dunbar neighborhood, so that riding our bikes across the river in the morning, I remarked at the spirit of the place – it really shone above the surrounding, languishing residential areas, and meeting Bing makes me certain that he is to thank. We got on the road in the early afternoon, with no fears of overheating after such a chilly morning. Dad took some videos on the road, complete with lots and lots of wind noise. See if you can hear anything we’re saying. We were lucky enough to stop for a little drag racing outside of Xenia…a perfect addition to the county fair and baseball game of the previous evening. 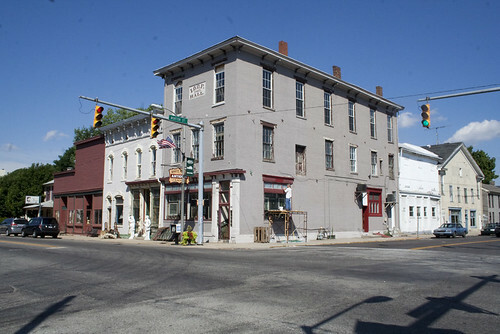 Yellow Springs is a beautiful town. I liked it even before we’d reached the center of the village, thanks to this sign. After a tour through this beautiful, perfectly chill town and a delicious, long-awaited pizza dinner, I sat listening to Aaron play piano while the parents chatted around the fire circle in the backyard. Yet more wonderful people I’ve met on this trip, which should be inspiring to all those timid souls who think America’s country roads are full of crazies. I’ve spent a lot of the last two days on Highway 40 – the historic route across the country built in 1806, according to the many signs I’ve passed. 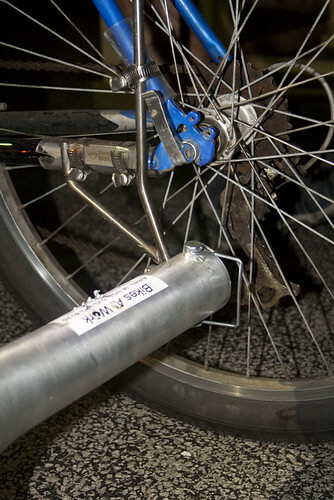 The days on the bike are starting to blend together – the riding itself is no longer the major event of the day, although it is certainly consuming. Perhaps it’s a sign I’m breaking into a rhythm. In any case, the towns I’m passing on Hwy 40 are all historic, all-American towns, each with its own post office and library, and a LOT of antique stores, and as I approached Richmond a spattering of motor-lodge style motels cropped up, most of them (sadly?) abandoned. 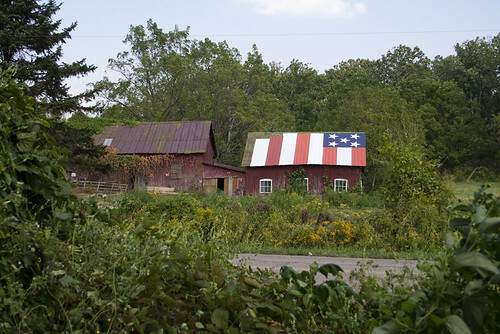 But the highway runs through the middle of town, lined with American flags, and many of the buildings are being repainted and cleaned up, and I’ve enjoyed stopping for water and snack breaks under the trees and at local shops. My stop in New Castle, IN, was a last-minute, lucky one. 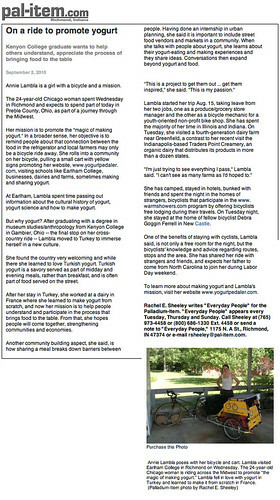 Deb was a fantastic warmshowers.org host, welcoming me into her home and even getting me an interview with Rachel Sweeney, her next door neighbor and long-term reporter for Richmond’s daily paper, the Palladium-Item. And as I left Richmond on Thursday morning, the woman who made my sandwich at the Lemont Hotel said, “You’re the yogurt lady!” and pointed out the article that had appeared in the paper that morning. I arrived at Earlham College in Richmond, IN, at noon on Wednesday, and I navigated the swarms of students heading to lunch, and soon I was set up in the middle of the Heart. Unfortunately approval delayed my set-up until after the lunch rush, but I talked to a handful of curious, enthusiastic students during class changes, and I was surprised by how many already made yogurt, as well as beer, sourdough bread, and kefir. 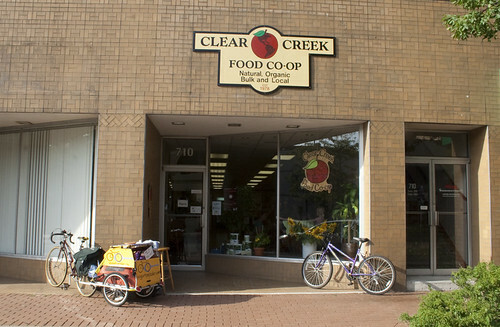 Then I headed to the Clear Creek Food Co-op in downtown Richmond – a sleepy Rust Belt downtown with plenty of potential for great pedestrian street life but unfortunately no pedestrians. Clear Creek was a great storefront, recently moved from a much smaller location, and I met a couple of local residents but spent most of my time waving at people staring at me as their cars slowly glided by on the street. My hosts of the evening were also generous to accept my last-minute couch request, and Mark, his wife Hopie, their daughter Lena and exchange student Janeen were so kind and comfortable. Mark even took me on a ride on his amazing electric-assist bike, which Hopie, Lena, and Janeen can all ride together, coasting up hills with barely an effort. Pumping my legs struggling up the smallest hills, and anticipating more hills in the weeks to come, it was thrilling to coast up hills at the slightest turn of my thumb. On Thursday, climbing past the Interstate and up a long, slow hill into the bright morning sun, I finally passed into Ohio! Oh, and as of Thursday night, in Brookville, OH, my total mileage for the trip has reached 531 miles. I spent a wonderful weekend in Indianapolis with my old friend Loren and his awesome mother Chartley. 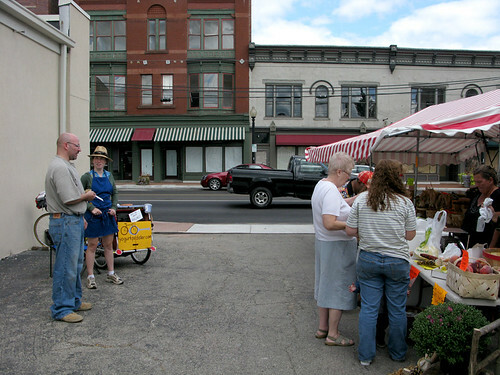 Saturday morning I trucked down at dawn to the Binford Farmers Market, where I spent the morning chatting with a much older crowd than at Urbana’s last weekend, but a welcoming one nonetheless. People were markedly more hesitant, which led me to break out a hastily drawn “Ask me about yogurt!” sign and stick it prominently to the back of my cart. And as I packed up to leave, two new friends took most of my yogurt off of my hands to use as cultures for their own incubation experiments. I hope they go well! 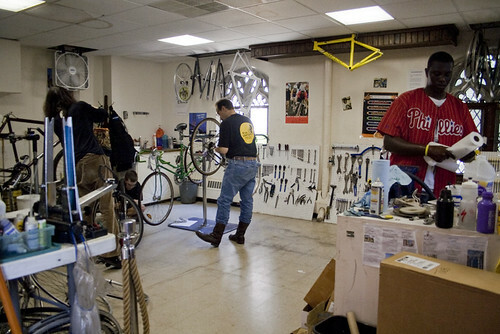 After lunch I eagerly headed to Freewheelin’ Bikes, a fantastic Earn-a-Bike program close to downtown Indianapolis. 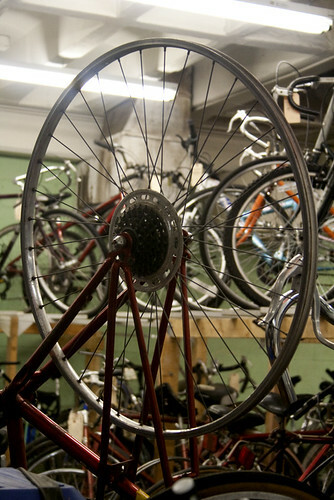 I was lucky enough to meet Nancy, the program’s founder, as she rushed off to prepare for a party, and set myself in front of the truing stand to straighten out a few wheels. 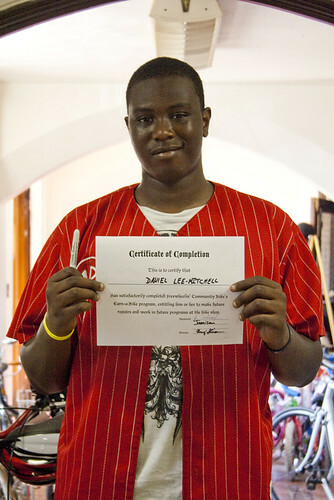 One of the kids, Daniel, finished earning his bike on Saturday, and he truly impressed me by his knowledge and comfort overhauling a really sticky headset. Congratulations to Daniel! Loren and I spent the rest of the afternoon at the library, then searched in vain for a street performance on the fringe of IndyFringe before settling down happily to beers and a game of Carcassonne at Upland Brewing Company. Sunday I was excited to visit DigIN, a festival that was supposed to promote local food producers and connect local restaurants. Loren and I waited in a couple of sweaty lines for tasty, but meat-filled, food, found no local farmers or producers to meet, and ultimately decided we’d rather eat melon at home than stand in a sunny field with hundreds of other people. 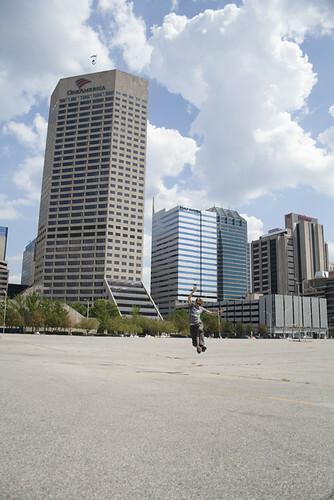 It was another good choice, but first we had to take a quick sweltering traipse through one of Indianapolis’ many downtown parking lots. One of the goals of this project is to encourage street life, and it’s something I feel very strongly about but which often gets overlooked in posts about headwinds and cows. So I will dedicate a post to just that – why I love street food and want to see more people out on the streets in their towns and cities. On a glorious spring day, buy a simit (a sort of crunchy sesame bagel) and a packet of cream cheese from one of the dozen vendors yelling “Simiiiiiit!!! Buyurun! !” outside the ferry dock. 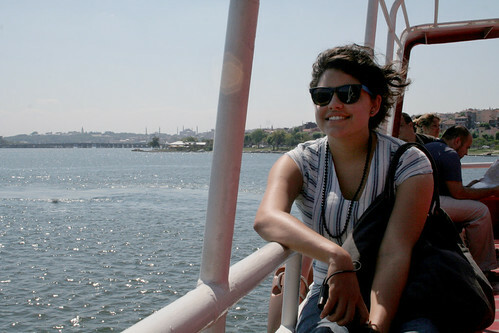 Once on the ferry, choose a seat outside – my favorite is along the side, on the benches where you can put your feet up on the side of the boat, just feet from the water splashing up in the wake. Then, buy a glass of tea, served in real glass glasses, with a spoon and a lump of sugar. There is really no better way to experience Istanbul than eating a simit and drinking a glass of tea surrounded by others crossing the Bosporus for myriad other purposes. Eating outside is the first essential part of my love for street life and street food. The best meals are often summer feasts at a restaurant with a beautiful terrace on a busy pedestrian street, but they are also just as often picnics in the park with nothing more than a watermelon and a good hunk of cheese. Simply being outside during a meal makes me feel like I am experiencing my environment completely. 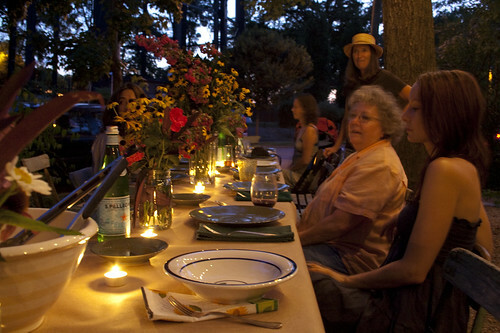 More important , however, is the inexplicable joy I find in eating outside — when the trees and fireflies and passing neighbors and friends are invited to partake in the feast of the senses. Then there’s the element of those passing neighbors and friends. 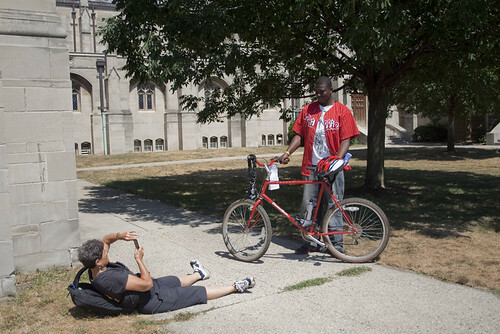 I’m riding my bike through the Midwest right now, and I’m meeting so many amazing people. Without these new friends and acquaintances – even the fleeting ones who question my destination or purpose in the parking lot of the library or gas station – I would most certainly have given up by now. It is for these people that I battle the headwinds and creep painfully up the hills, because my goals are always to inspire curiosity and communion with our environments. And by “environment” I don’t mean the trees and rivers and smog-filled air, although that’s a part of it. I also mean the human and built environments; who are our neighbors? How can they support us, challenge us, make us laugh? What are these streets and buildings that we live in? What stories have they seen, what events will they stage, what actions do they encourage, and what character do they lend to our communities? Without populating these environments, and engaging others in them, we can never truly know the answers to these questions. 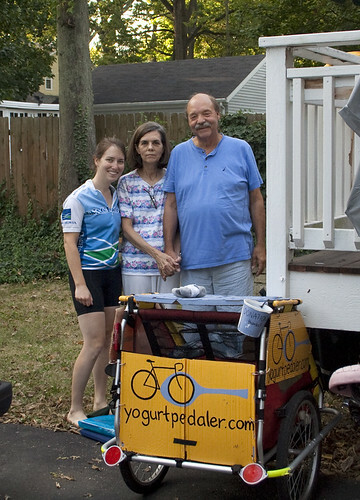 Holly Whyte wrote in The Social Life of Small Urban Spaces, “If you want to seed a place with activity, put out food…Food attracts people who attract more people.” And this is why I am so passionate about the Yogurt Pedaler inspiring street life; because bringing people together on the street, over food, is the best way to inspire new encounters with neighbors and visitors, to discover new uses for our built environment, new ways for cities to create spaces that nurture the people and businesses and homes that communities so need in order to survive and flourish. 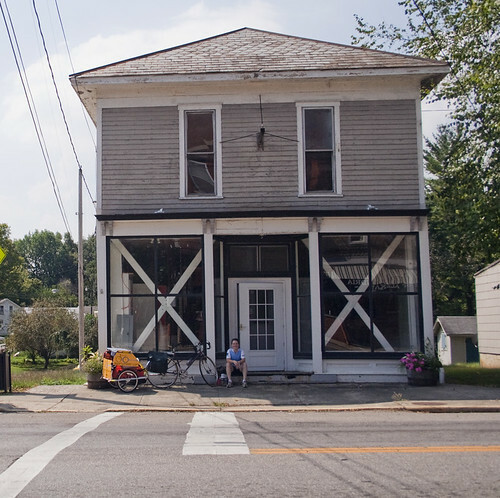 We all recognize the spaces we love in our towns – they’re not parking lots, or tiny sidewalks next to busy roads, or dirty alleyways. 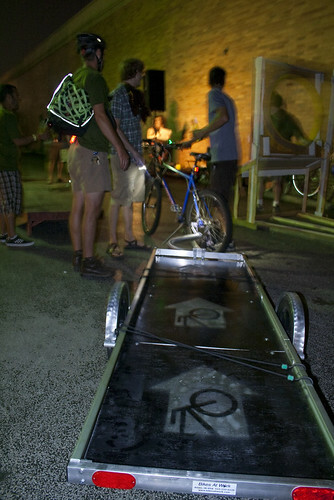 Perhaps they’re tree-lined residential streets where children play on sidewalks and neighbors mingle on front porches. 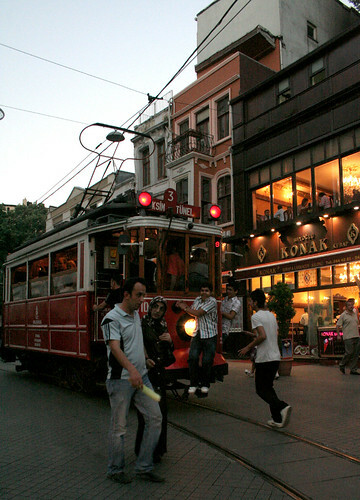 Or busy urban plazas where businessmen and tourists eat lunch, and perhaps there’s a concert in the evening. 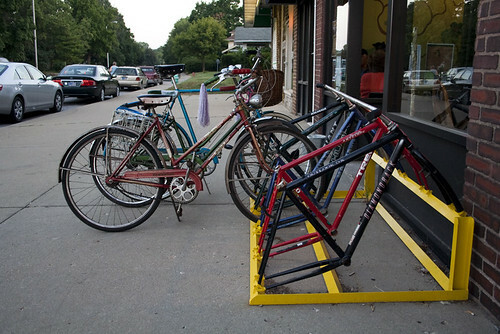 They’re neighborhoods where friends meet at the local coffeeshop, ramble down the street to the park, or up the block to the bookstore, and can buy their groceries or visit the post office along the way. They’re places where people feel safe, because they are familiar with the landscape, because there are other people around, and because there are spaces to do the things we like best. And doesn’t everyone love to eat? I woke up early for the market on Saturday, but not early enough – by the time I got there, things were bustling and busy. I found a spot next to the Muffin Man, and there was a steady stream of people for the next 2 ½ hours. It was a fantastic morning; people were genuinely interested, and curious. 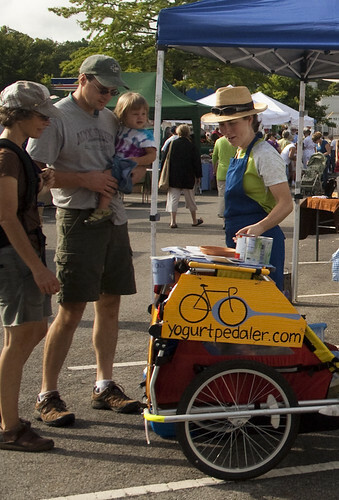 I met a journalist from the local paper, and an alternative transportation planner who loved my cart, and plenty of people who had made yogurt before and just as many who had no idea where to start. I suppose it shouldn’t be surprising, since I do it myself, but nonetheless I was humored by how many people just walked by slowly, obviously curious, but too timid to stop and ask what I was doing – afraid to make the commitment, perhaps afraid I was trying to sell something, strange yogurt products or ideas, plrothelytizing about some radical new food movement. 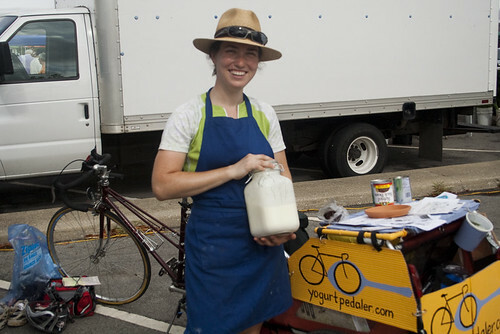 Someone at the Bike Project later that night suggested I hold a sign that says “ask me about yogurt” and I think I’m going to do just that for next weekend’s market in Indianapolis. 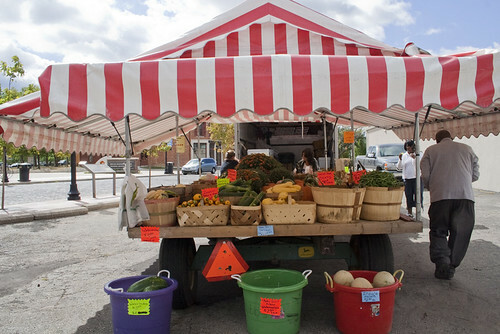 Once the heat descended with full force, and even my straw hat was doing little to keep me warm and sane, I moved just next to the market to the Common Ground Food Co-op, a popular Chambana source for local and organic produce, groceries, and prepared foods. I stood out front, right next to a big poster for Kilgus Farms milk, and next to Becca, who was leading a children’s activity to promote the daycare she’s starting. I don’t remember how I found out about Common Ground, but I remember expecting it to be something like Open Produce, considering how often we are compared to Logan Square’s Dill Pickle co-op. 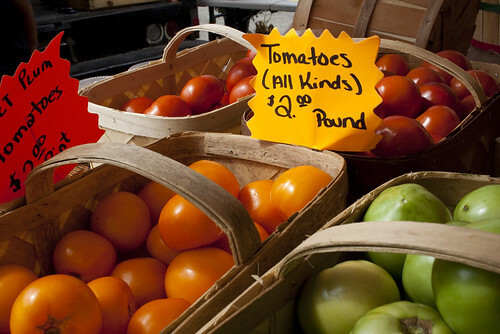 But when I walked in, I realized how much Open Produce’s dedication to affordable, dependable, everyday groceries really is a guiding principle in stocking the store. Common Ground was beautiful, and the produce and drygoods were all appealing and ethical, and of course I was jealous of their deli counter, but I did miss OP’s uneven yellow shelves of cheap Indian meals and stacks of dollar cans of beans. 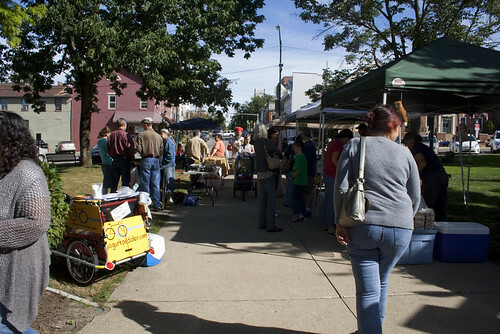 The crowds at Common Ground were much more focused on shopping, so I got much less traffic. Becca and her son Joshua were great at attracting attention, steering all of the families that stopped for melon over to my much smaller cart for some yogurt. 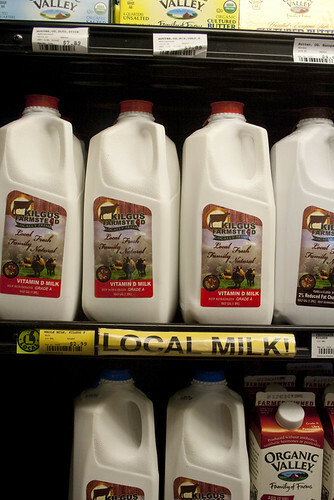 Kilgus Farms milk on the shelves!! Once the market had cleared out, traffic at Common Ground also completely died off, so I got some lunch and packed everything up. I headed straight for the post office, unloaded everything, and stuffed two boxes full to send back to Chicago. 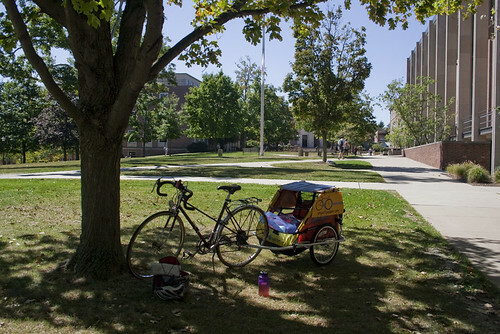 One hour later and 15 lbs lighter, I took off for the UIllinois campus, in search of a busy quad where I could attract new students and their parents on move-in weekend. No such luck. Especially compared to Kenyon, UIllinois is enormous, and I never even found a quad that had traffic; everyone seemed to be crowded around the front doors of dorms, which I suppose also made sense. 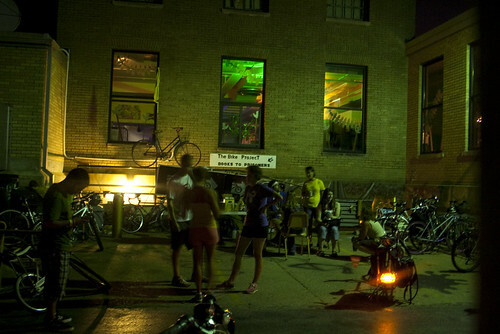 That evening was spent at the Mustache Ride after-party, hosted by the Bike Project at their awesome space underneath the old post office in downtown Urbana. 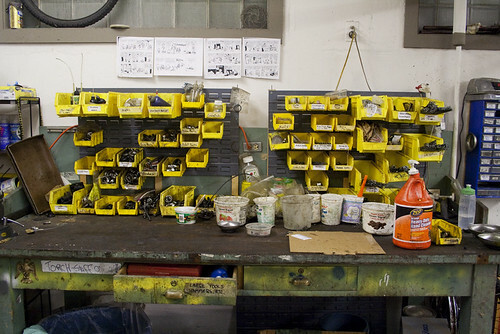 I met some great people, and I was totally jealous of how clean their shop was. And while they did have some cool bikes to play with, I’ve also got to admit that Blackstone’s kids give them some real competition. We headed home at the end of the night, and I was so excited to sleep in on Sunday morning. Up at 8, I spent nearly the entire day writing and researching routes and contacts for the rest of the trip. I was so focused, I missed the Quad Day event I had planned to visit, and I only noticed when the library closed that it was already 5:00. 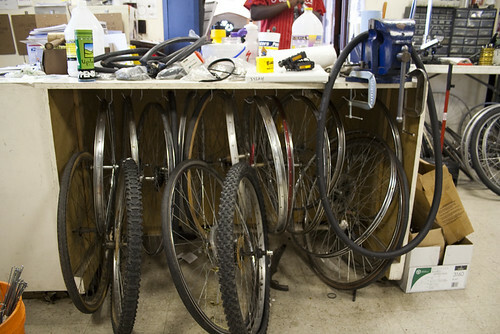 I had more bikes to wrench on, though, and I headed over to the Campus Bike Project shop on the south side of town. 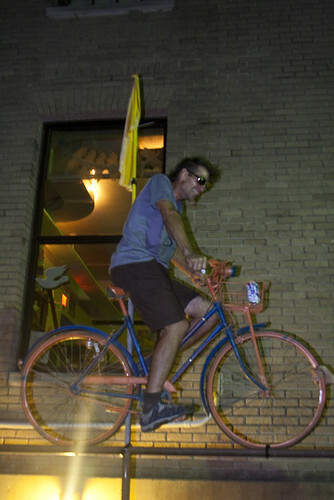 They’ll be ready for a Tweed Ride in Urbana, no doubt. 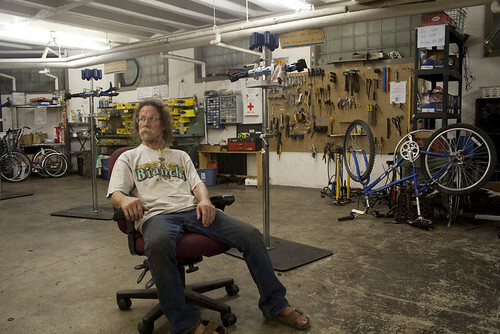 I left a handful of cards and tore myself away from the Bike Project. Thanks, guys, for welcoming me and showing me such a great organization and good people. 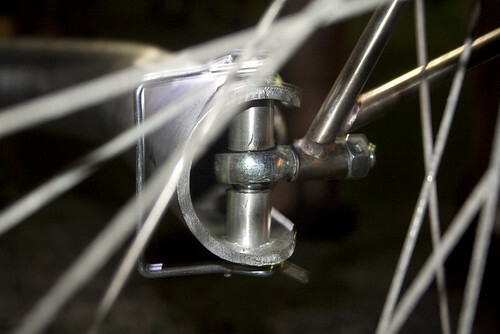 My flat tire on the way to Faye and Joyce’s didn’t deter me, and I trudged on to dinner and an early bedtime.